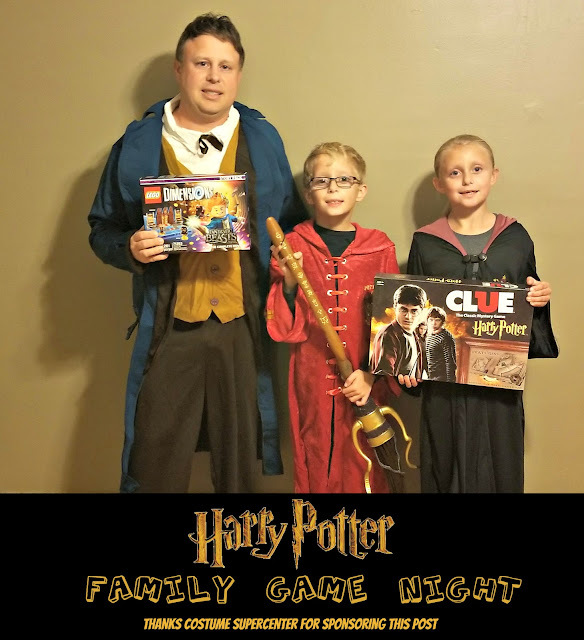 Everyone in our family is a big fan of the wizarding world created by author J.K. Rowling and enjoyed an evening at home together having fun with a Harry Potter themed game night. The nice folks at Costume SuperCenter helped get us into character for our Harry Potter game night providing us with costumes for some of our favorite characters. Dressed up for the occasion we had an entertaining evening playing a Top Trumps card game, USAopoly's CLUE board game, and the LEGO DIMENSIONS video game. My son dressed as the famous boy wizard in his Quidditch team robe along with his Firebolt Broom while my daughter was outfitted in the Hogwarts School of Witchcraft & Wizardry uniform of Hermione Granger. I sported a Newt Scamander costume from the movie Fantastic Beasts and Where to Find Them. 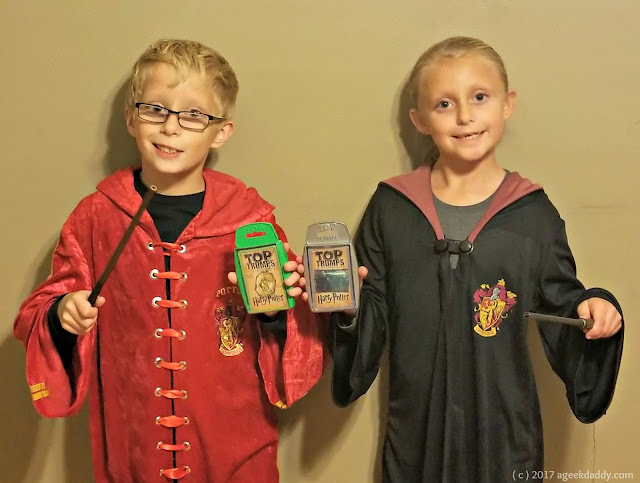 The kids also brought out their magic wands we picked up during a vacation at Universal Orlando Resort's Wizarding World of Harry Potter to help set the mood. We started our evening off playing a few rounds of the Top Trumps card game. Top Trumps card decks have been popular overseas in the United Kingdom for decades. Teachers over there have been recommending students play this card game which incorporate a variety of themes ranging from animals to super heroes since the 1970's as a fun way to improve children's literacy and numeracy skills. Over the last ten years, more than 80 million packs of Top Trumps cards have been sold in England making it one of the best-selling games in that country. Top Trumps games are just becoming available in the United States and if you have children between the ages of 6 and 12 you should absolutely check them out. Top Trumps has a variety of card decks themed around various Harry Potter movies including Prisoner of Azkaban, Half-Blood Prince, Goblet of Fire, Order of the Phoenix, and Deathly Hallows Part I + Part II. Each card in one of these Top Trumps' Harry Potter movie decks is based upon a character from the film. It has an illustration of the character from a scene in the movie, a paragraph describing the scene, and game rankings for the character in the categories of magic, cunning, courage, wisdom and temper for use in playing the game. We had the Deathly Hallows Part I + Part II Top Trumps decks to play for our Harry Potter family game night. To start the game, shuffle and deal all the cards in the deck face down to the number of people who want to play. Each player picks up the card at the top of their pile so only he or she can see it. The player to the left of the dealer starts out by naming the character on the card being held and reading a category from it (Magic 95). The other players then identify the characters on their cards and read out the same category. The one with the highest value wins the hand and takes all the cards. If there is a tie than the cards are placed in the middle of all the players and whoever wins the next round wins them from both rounds. You flip over one card dealt to you each round so players don't know what entirely they have in their stack as you are playing through the game. 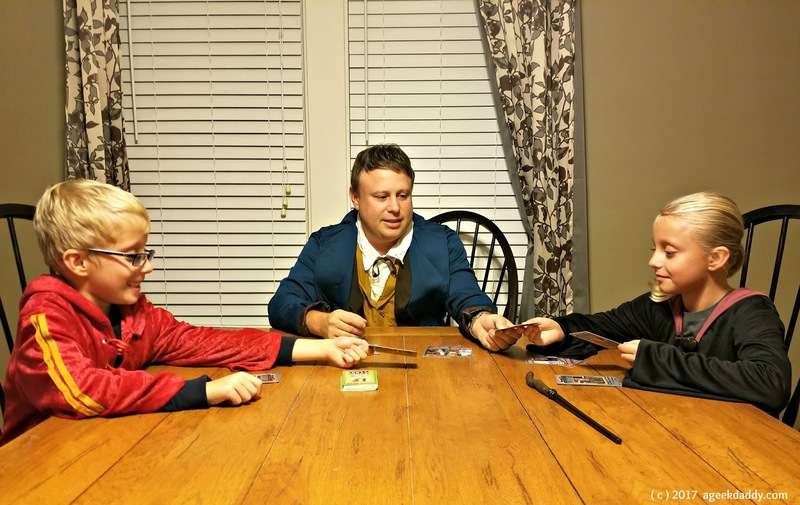 So for example in one round I had Mr. Ollivander and called out WISDOM 72, my daughter had Ron Weasley WISDOM 60 and my son had Severus Snape WISDOM 76. He won the round and took everyone's cards. From a strategic standpoint you never want to let people know the character in your hand before the person who starts a round says who he or she has. In another round it was my turn to start, I had a Harry Potter card and was about to call out MAGIC 95. My son blurted out he had Lord Voldemort before I said anything. Considering Voldemort might be more powerful in magic than Harry Potter I instead called out COURAGE 80. My son replied COURAGE 0. Ha Ha Dad won that round! Players can choose two different ways to determine a winner. One is when you win cards they can be shuffled into your deck and used in future rounds. The game goes on until only one person is left with cards who is the winner. The other version is players place the cards they win off to the side. Once one player has lost all of his or her cards the game ends and everyone else counts all the cards they have. Whoever has the most cards wins the game. 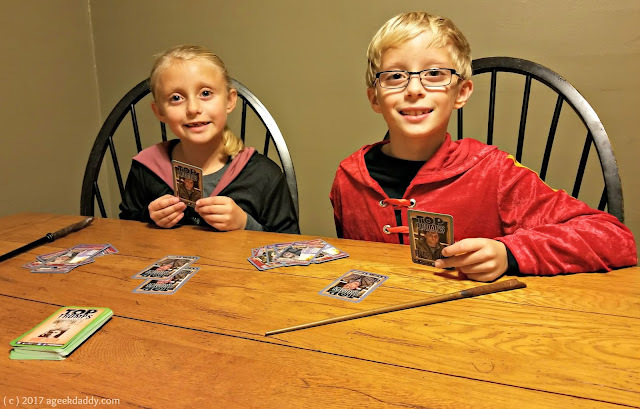 My kids always have a great time playing the Top Trumps card games and because they have a huge variety of decks to choose from it is always a nice option to include in a themed family game night. Despicable Me, DC Comics, Marvel, and Star Wars are some of the brands of Top Trumps card decks available that would make great themes for a game night. Plus when you are done playing Top Trumps, the deck comes with a sturdy plastic case to keep your cards stored in when not being played with. Between playing Top Trumps and our next game, we took a Butterbeer break. Actually we substituted a Detroit classic, Vernor's Ginger Ale, for Butterbeer. 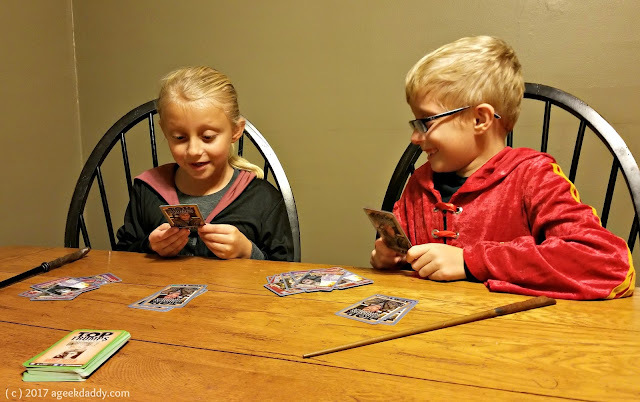 It was still a delicious treat for our Harry Potter game night! Next we played a Harry Potter version of the mystery board game CLUE from USAopoly. The plot of the game revolves around a student at famous Hogwarts School of Witchcraft and Wizardry vanishing. It is up to the players in the game to solve this mysterious disappearance. Playing as Harry, Ron, Hermione, Ginny, Luna, or Neville you try to discover WHO did, WHAT spell or item they used on the student, and WHERE the attack took place. 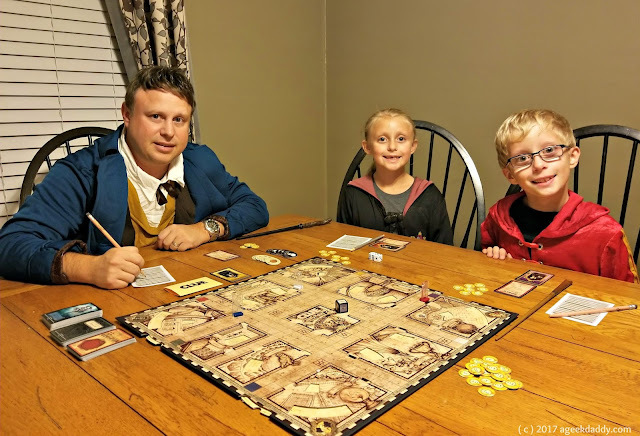 Just like how the staircases move at Hogwarts in the Harry Potter books and movies, as players move around the game board trying to solve the mystery each turn wheels are shifted changing the setting by revealing blocked doorways, secret passages and even the Dark Mark! You'll need to protect yourself from the Dark Mark with spells, allies, and items provided through Help Cards. If you can make it around the USAopoly Harry Potter CLUE game board and protect yourself from the Dark Mark you should be able to gather enough evidence to solve the mystery. Get to Dumbledore's office and make your accusation to win the game! 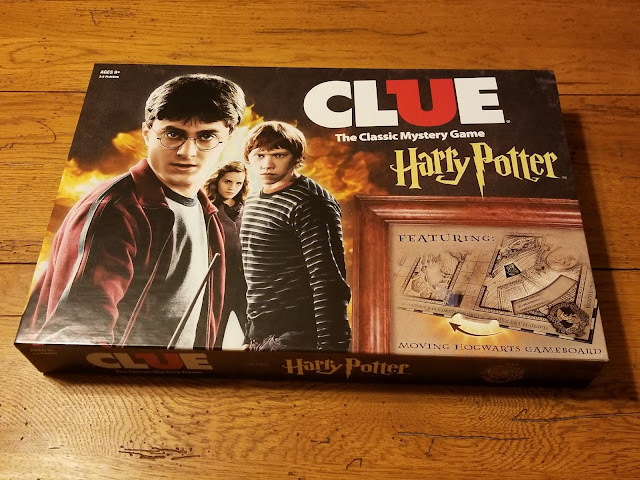 USAopoly Harry Potter CLUE is meant for 3 to 5 players and recommended for ages 9+. To get a better description of how to play the game and more detailed look inside the game's box from USAopoly please CLICK HERE. My daughter won our evening game of CLUE proclaiming it was Dolores Umbridge with the sleeping draught in the potions classroom who made the Hogwarts student go missing. We wrapped up the evening playing the Fantastic Beasts and Where to Find Them story pack for the LEGO DIMENSIONS video game on our PlayStation 4. This expansion to the video game is based upon the prequel movie to the Harry Potter series of films and provides six new levels of gameplay revolving around Newt Scamander's efforts to find his escaped magical creatures within New York City. 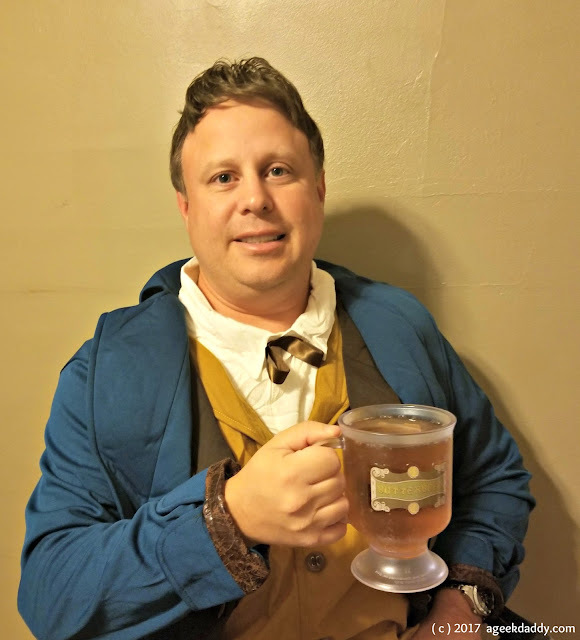 As Newt Scamander, players can utilize magical spells including Diffindo, Reparo and Lumos plus interact with fantastic beasts like the Niffler, Swooping Evil, Bowtruckle and more. The story pack also unlocks two Fantastic Beasts and Where to Find Them themed open play areas, an Adventure World and Battle Arena. Within the Battle Arena up to four people can play at once with split screen views as they compete against one another in different types of matches. In addition to playing as Newt Scamander, you can also use any other character available in the LEGO DIMENSIONS collection within the story levels, Adventure World and Battle Arena. 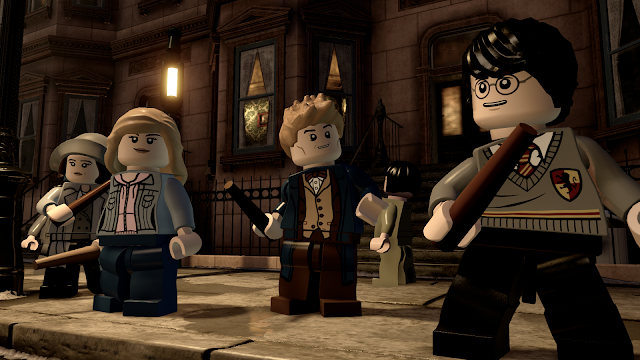 So of course we added Harry Potter and Hermione Granger into our gameplay! Our whole family always has a good time playing LEGO DIMENSIONS together and the video game was a great fit for our Harry Potter game night. Kids grow up so fast! Adding a bit of flair to a night of fun playing games together is a great way to get children engaged in participating while allowing adults to have a good time too. Plus nights like these make for some great family memories! We really had a magical time during our Harry Potter Family Game Night that we are sure to remember. These are great! We would love playing these together as a family. I had no idea there was a Harry Potter Clue! 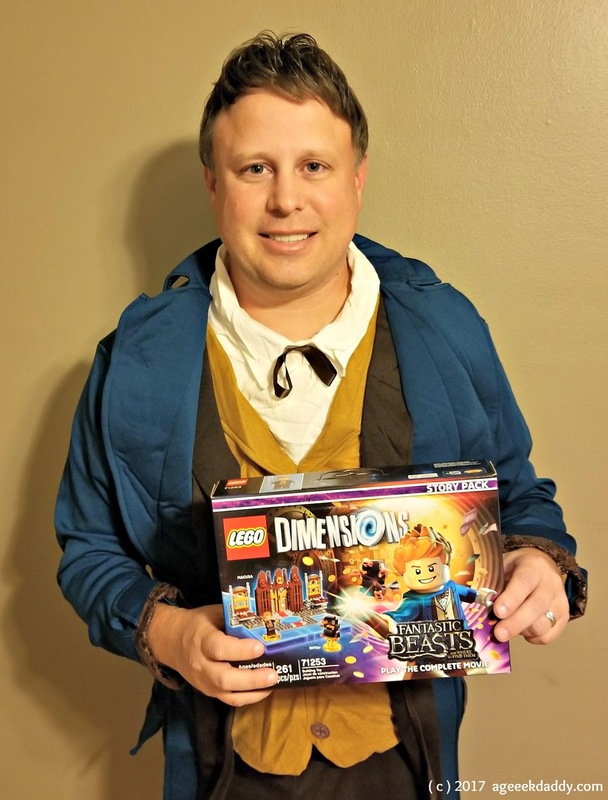 I need to get that Fantastic Beasts add on for Lego Dimensions. My kids love that game. There's a Harry Potter Clue?! Sorcery! I have to get this for our next family game night. Sounds like you all had a fun night! We love doing a family game night! We need to check out a few of these games to play on our next fame night! 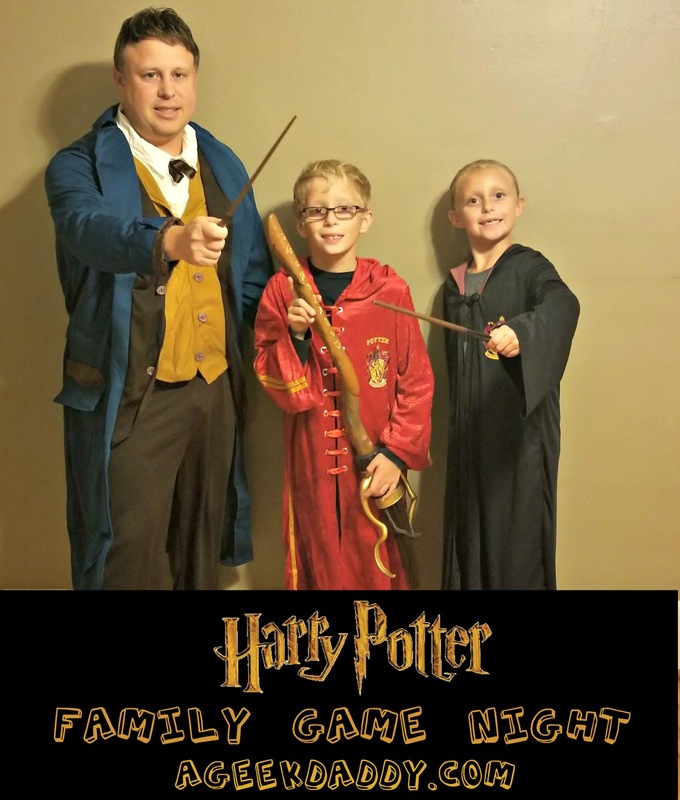 YES for Harry Potter family night! I love it!! I love that you guys dressed up for game night! That is wicked cool. The games that you featured are also so much fun! The Top Trump sounds interesting! I like the idea of Harry Potter night. Sounds fun! This looks like a lot of fun. I have never seen the Harry Potter movies but I think I will have to check this out! This looks like so much fun. I never thought of dressing up while playing games with the kids. They would love it. I still love Harry Potter! My kids don't really know much about him, but I need to have them watch the movies soon. I love the Top Trump cards. We just got a bunch of them from the Chicago Toy and Game Fair and we loved playing them. This sounds like the game night we would have. There's nothing better than having geeky parents who are into the same stuff you are! My kids love Clue. They got it for Christmas last year. It's such a fun game. We finally have a game room so we can play card and board games really easy. I'll look into these two games. I know my 8 year old will be a fan of the Harry Potter game. We love our family game nights, but we sure never thought of dressing up for it. I love the idea though. You all look good in your outfits! This is a really fun game night. I need to add costumes into the mix so we can really have some fun.